I’ve been working with Roberto, the Chief Innovation Officer of a diversified company I’ll call Sprocket Industries. As Sprocket’s Chief Innovation Officer, Roberto was a C-level executive responsible for the corporate innovation strategy in a multi-billon dollar company. Over the last 9 months his staff got innovation teams operating with speed and urgency. The innovation pipeline had been rationalized. 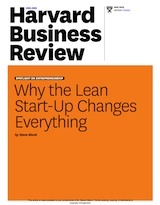 His groups whole-heartedly adopted and adapted Lean. His organization ran a corporate incubator for disruptive (horizon 3) experiments and provided innovation support for the divisions for process and business model innovations (Horizon 1 and 2.) He had an innovation pipeline of hundreds of employees going through weekend hackathons and 45 different innovation teams going through 3-month rapid Lean LaunchPad programs to validate product/market fit. Sprocket is a permanent organization designed to execute a repeatable and scalable business model. Roberto’s innovation teams are temporary organizations designed to search for a repeatable and scalable business model. Roberto’s group had spent the last 9 months educating the company about why they needed to deliver continuous innovation, and why the execution and innovation teams need to work collaboratively. But while there was lots of theory, posters, memos, and lip-service to being innovative, it wasn’t working. I offered that a top-down revamp of every business process should be a last resort. I suggested that Roberto consider trying a 6-month experimental “Get to Yes” program. His teams, not outside consultants, would write their own innovation processes and procedures. Most of the impediments the innovation teams faced were pretty tactical: for example an HR policy that said the innovative groups could only recruit employees by seniority. Or a branding group that refused to allow any form of the Sprocket name to appear on a minimal viable product or web site. Or legal, who said minimal viable products opened the company to lawsuits. Or sales, who shut out innovation groups from doing customer discovery with any existing, or even potential customer. Or finance, who insisted on measuring the success of new ventures on their first year’s revenue and gross margin. We agreed that the goal was not to change any of the existing execution processes, procedures, incentives, metrics but rather to write new ones for innovation projects. And these innovation policies would grow one at a time as needed from the bottom of the organization, not top down by some executive mandate. If we were successful, innovation and execution policies, processes, procedures, incentives, metrics would then co-exist side-by-side. In their day-to-day activities, the support organizations would simply ask, “Are we supporting an execution process (hopefully 90% of the time) or are we supporting an innovation process?” and apply the appropriate policy. The “Get to Yes” program was pretty simple. Every time an innovation team needed a new policy, procedure, etc. from an existing organization (legal, finance, sales, HR, branding, etc. 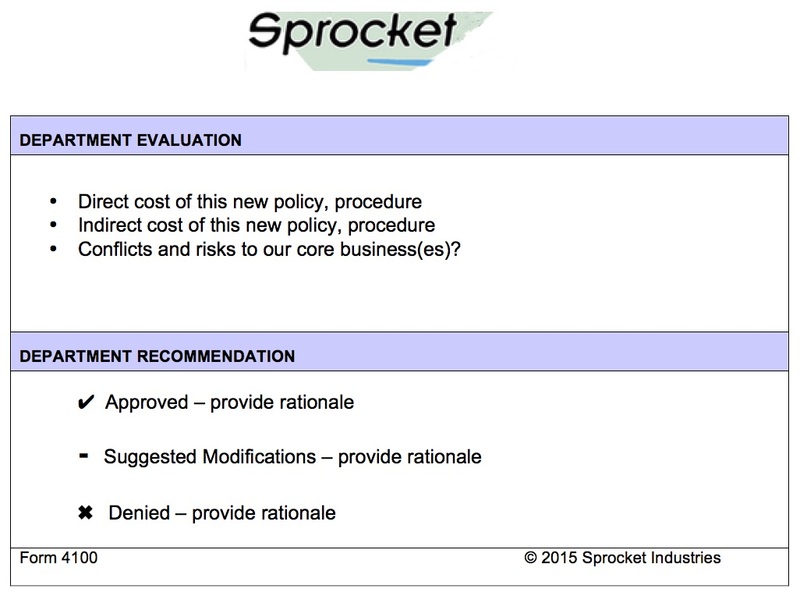 ), they submitted a standard Sprocket corporate “Get to Yes” request form. The form was a single page. 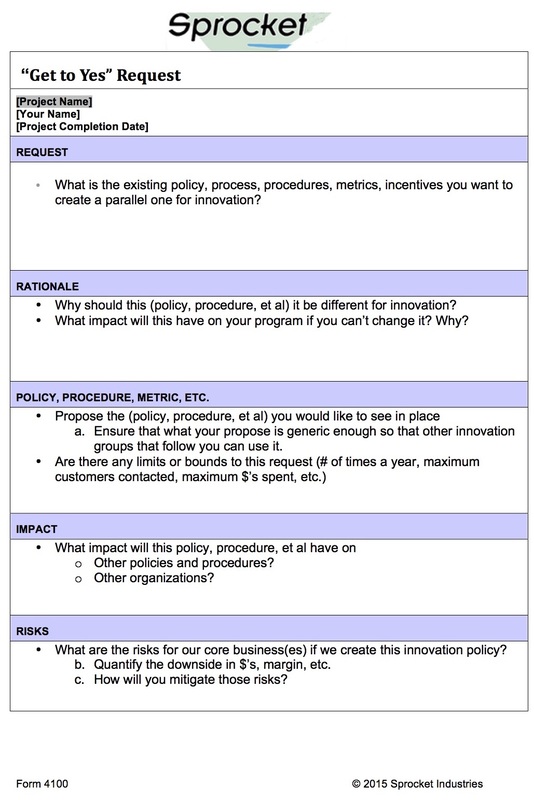 It asked what policy the innovation group wanted changed, why it wanted it changed, how it wanted the new policy to read, the impact the new policy would have on other policies and organizations, and most importantly the risks to the core existing business. The innovation team would be proposing the new process, procedure, metric, etc. – not waiting for one to be written. Yes was the default answer, a No required detailed explanation. Appeals went straight to the Chief Innovation Officer. The big idea is that Sprocket was going to create innovation by design not by exception, and they were going to do it by co-opting the existing execution machinery. The time for a process resolution in a billion dollar corporation – two weeks. At Sprocket innovation was starting to move at the speed of a startup. Priceless! Im sending this everywhere ! resonates very much! the hard work of innovation in a big company is not just the shiny, innovative products but the less shiny innovation tools/process/policies that you rewrite and evangelize. #itworks. Thanks as always for the great advice! Tremendously smart and helpful! Thank you, Steve, this deserves a lot of attention – and I am sure will get it! I am doing my part spreading this in Europe. Very interesting post. To me it triggers a deeper question, what is the most effective strategy to make big organisation better in delivering value as efficient as smaller companies can? A Lot has got to do with cultivating mindsets. 2 options: #1 provide space to a select group of employers that already comprehand, and are willing to begin from scratch. 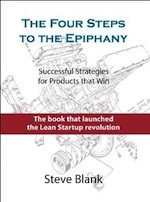 Let them build lean startups, based upon the companies mission/vision/goals. 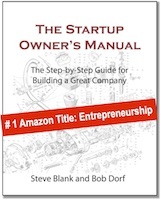 And let succesvol ‘startups’ take over excisting employers: take over the company. Or #2 try to change (old) cultures and cultivate the idea that an oil tanker should become a speedboot? With his current knolledge, what would roberto advise others to do? I work in a large (2400 empl.) edu organisation that should radically change in becoming more effective in providing personal engaging learning spaces. Otherwize we’ll loose it from the online universities. #1 seems better, but what do the experts say? And if so, how could your experiance convince our ceo’s to opt for #1? All relevant imput is welcome…. I had a similar epiphany while working with quality professionals who wanted to explore how they might embrace the practice of collaborative innovation to enhance problem solving. This group was naturally adept at tying their work to the existing management system. could you share some examples showing the impact of this approach?